Premium Compatible Label Tapes for the Dymo LABELMANAGER 160 printer. The Dymo Label Manager 160 is an easily portable printer that can be easily held in one hand and is extremely simple to use. The printer measures about eight inches from top to bottom. At the top of the device, it has a preview screen. The keyboard has a QWERTY layout and there is a separate line of formatting keys. For navigation purpose, it uses a familiar D-pad. The printer supports up to six different font sizes that depend on the size of the label, and it can be in bold and italicize styles. There are different formatting options available. It includes a decent amount of clip art and a variety of symbols. One can use one of the five different underline and box styles and print on two lines with Dymo Label Manager 160 Label Tapes. At the back of the printer, the batteries and label cassette are installed. It features a built-in library that contains more than 200 images and symbols. The printer comes with an auto-shutoff function. When the unit is idle, this function keeps the display from running out. The Dymo LabelManager 160 is a worthy option for its price. It is very simple to use and it features soft QWERTY keys, a large display and the formatting keys that are very attractive. It provides sufficient formatting options for an individual home user experience. But the battery and charger options are some of the limitations for its performance. How to remove and insert the new Label Cassette for my Dymo LABELMANAGER 160? Your label maker uses DYMO D1 label tapes which are designed to give you long and trouble-free services every time it prints. But using the old ones might affect the print quality which is a major concern. Therefore, you must remove the old Dymo LABELMANAGER 160 Label Tapes and insert the new ones, on receiving poor prints. Select the new label width when prompted to do so by the label maker. Gently lift up the label cassette cover to open the label compartment. Make sure that the ribbon and label are taut across the mouth of the cassette in such a way that the label passes through between the label guides. If required, turn the ribbon rewind spool in a clockwise direction so as to tighten the ribbon. Insert the new Dymo LABELMANAGER 160 Label Tape in its place and press firmly until the cassette clicks into place. How can I improve poor print quality of Dymo LABELMANAGER 160? The Dymo LABELMANAGER 160 Label Tapes are designed to ensure trouble-free printing, but there are times when printing can get problematic. If you face problems while printing labels, we can help you out! Below are a few troubleshooting tips to resolve some poor quality issues. Replace the label cassette when necessary. Also, clean the cutter blade each time you replace the label cassette. Q. What are the different sizes of Dymo LABELMANAGER 160 label tapes provided on your website? A. We sell Dymo LABELMANAGER 160 label tapes of 3 dimensions. They are 12mm x 7 meters, 9mm x 7 meters and 6mm x 7 meters. Q. How do I clean the cutter blade of my Dymo LABELMANAGER 160? How often does it require cleaning? Remove the Dymo LABELMANAGER 160 label tape from the device. Hold the cutter button to expose the blade. Pour some alcohol on a cotton ball and clean both sides of the blade carefully. Use caution while cleaning the cutter blades as they are extremely sharp and may hurt you. Q. Is it necessary for me to insert batteries into my Dymo LABELMANAGER 160 whenever I use it? A. No it is not necessary for you to use batteries to power up the LABELMANAGER 160. A 9 volt, 2A power adapter is provided with in the box that you also use to power up the device. You can simply use it by plugging the power adapter to the connector at the top of the device and connecting it to a power outlet. Q. Why does the Dymo LABELMANAGER 160 not require any ink cartridge or toner cartridge to print on the labels? A. Label makers do not require ink cartridges or toner cartridges to function, because they are thermal printers that use heat from a thermal print head to print on the label tapes that are heat sensitive and specially designed for such use. Thus, the only supplies that you will need to buy for this printer will be label tapes. Q. Can using compatible Dymo LABELMANAGER 160 label tapes void my device’s warranty? A. Absolutely not! Using our compatible label tapes will not affect your printer’s warranty at all. Our compatible label tapes are of great quality and will not affect your printer’s performance. These label tapes are designed to produce great quality output. Q. How can I remove the backing from the label? A. Dymo label comes with an easy-to-peel split back. Q. Can I create Two-Line Labels from the Dymo LABELMANAGER 160 printer? Enter the text for first line and then press enter. The symbol will appear on the screen. This symbol will not be not printed. Enter text for the second line. Press the print option to print the label. Q. What is the expected shelf life of the Dymo LABELMANAGER 160 Label Tapes? A. If stored securely, the shelf life for the LabelWriter label tapes is 18 months. To prolong the life of the tapes, store them in a cool and dry place in a black bag when they are not in use. Q. What type of batteries does this Dymo LABELMANAGER 160 use? A. The label maker uses six AAA alkaline batteries. Q. I want to order the compatible Dymo LABELMANAGER 160 Label Tapes from your site. What payment options are available? A. If you have to make an order, you can make your payment through Laser Card, American Express, MasterCard or Visa credit card, Maestro, Switch, Solo or Delta debit card. When you purchase an item on this site the payment will be hosted by Sage Payments to ensure maximum security of your credit/debit card details. Q. Does the compatible label tapes you offer are cost effective in nature? A. Yes, the Dymo LABELMANAGER 160 Label Tapes we provide are efficient in printing labels and are low in cost compared to the original brands. One can be assured to get the desired print result at such low price. Q. What should I do if the label gets jammed inside the printer? Remove the jammed label and replace it with a new label cassette. Clean the cutter blade and care your Label Maker. Q. Do you sell Dymo LABELMANAGER 160 printer on this site? A. We currently do not sell the printer, but there are many online sites selling label printer at the affordable prices. Q. Do I need to pay extra to get the order for my Dymo LABELMANAGER 160 Label Tape on time? A. No, you do not need to pay extra money to get the order on time. Most of our orders are delivered within 1-2 days by Fastway couriers and will be delivered before the estimated time. Also, if you want to check the status of your order, go to the orders and return page and check the status of your product. Q. What should I do if the ink ribbon got caught in between the tape layers and came out of the machine? A. This happens when you install the Dymo LABELMANAGER 160 Label Tape leaving the ink ribbon loose, or by pulling the printed label out by hand. If the problem is still not resolved, replace it with a new Dymo LABELMANAGER 160 Label Tape. For replacing the tape refer your user manual that came along with the printer. Q. Does Dymo LabelManager 160 have arrow symbols? A. Yes, there are arrow symbols present on the device. Q. How can I create vertical labels with my labelmanager 160? A. You can print labels with the text oriented vertically. When printing two-line vertical labels, the label will printed with the second line of text after the first line. To create a vertical label enter the text and then, press to print. You will get your labels printed in vertical form. Note that the underline style will not print on a vertical label. Q. How to clean the printheads from the Dymo LabelManager 160? Remove the label cassette from the machine. Remove the printhead cleaning tool from inside the label compartment cover. If you do not have a cleaning tool, you can order one from the support site. Gently wipe the padded side of the tool across the printhead to get better results. Q. Does this machine uses ink cartridges? A. No, it just uses the Dymo LabelManager 160 Label Tapes to print labels. Q. How can I add symbols while printing labels? Press up and down arrow key to select symbols. Press OK.
You can use the navigation keys to select the desired symbol. Press to add the symbol to your label. Q. How to improve the poor print quality of Dymo LabelManager 160? Replace the batteries or connect the optional power adapter. Ensure that the Dymo LabelManager 160 Label Tape cassette is installed properly. Replace the Dymo LabelManager 160 Label Tape if the results are not satisfactory. Q. What should I do if I got the message of low battery? How can I insert them? A. If you get the message of low battery, replace all the batteries with the new one or connect the optional power adapter to continue with the printing. Press the thumb latch on the back of the label maker to remove the battery compartment cover. Insert the batteries following the polarity markings (+ and –). Replace the battery compartment cover. Note that you must remove the batteries if the label maker is not being used for a long period of time. 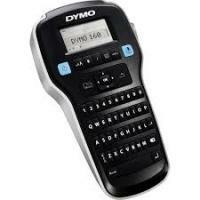 Q. I have recently purchased Dymo label printer. Do I have to purchase the label tapes separately? A. Your machine comes with one Dymo LabelManager 160 Label Tape, you will need to buy more once they get over to continue printing labels. Q. How to return the non-faulty items, if have ordered wrong label tapes for my LabelManager 160? A. If you have ordered wrong item, please return an item in its original and undamaged packaging with all of its components so that we can re-sale it. Your order will be refunded only in accordance with our refund policy. For more information regarding this can visit to the terms and condition page. You can anytime place the order for the new Dymo LabelManager 160 Label Tapes after getting your refund.